Amy Denio is a multi-instrumentalist, composer, and singer based in Seattle. 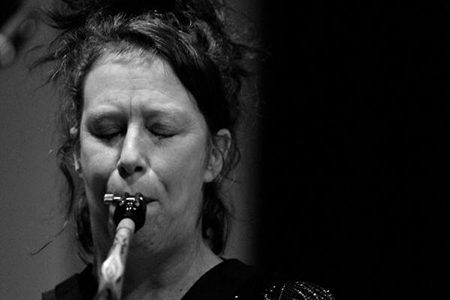 Since the mid-80s she has maintained a constant flurry of musical activity spanning many genres: free improvisation, art rock, scores for dance and film, solo and in groups such as the Tiptons Sax Quartet, Hell’s Bellows accordion ensemble, Kultur Shock, Correo Aereo. Tonight she offers a set of solo vocal improvisations with live electronics. Clarinetist/vocal percussionist/composer Beth Fleenor and her band Figeater‘s disjunctive, raucous, soaring, and powerful improvisations are punctuated, buttoned, and launched by original compositions and song-like psychedelic episodes, with an emphasis on environmental participation.